Beautifully engineered design. A family towel rail that revels in its simplicity. Exuding warmth and comfort, this model with square horizontal bars fits in with any bathroom decor or theme. One of the Aeon Aluminium range. 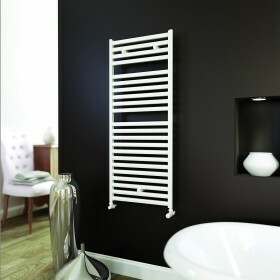 Aeon Banio Towel Radiator - lowest UK price with free delivery, (* See terms ) Aeon accredited retailer. Aeon designer radiators. Beautifully engineered design. A family towel rail that revels in its simplicity. Exuding warmth and..